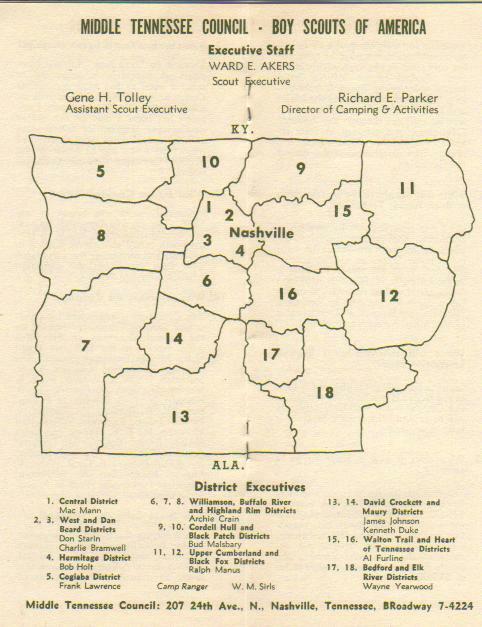 This MTC District map comes from the 1959 Boxwell Reservation Development Fund. The districts shown here are identical to the lists in the 1956 and 1962 Scout Circus programs, so we can assume that this map is representative of that entire period. There are quite a few changes from the 1954 district list. Gone are Coffee, Marshall, Warren, and White Districts. New districts include Black Fox, Buffalo River, Dan Beard, and Elk River.